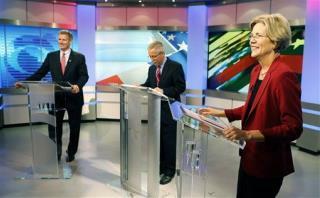 (Newser) – The Massachusetts Senate battle between Elizabeth Warren and Scott Brown had been a fairly cordial one—but lately, both candidates are changing the tone. Democrat Warren has been focusing on aligning Brown with fellow Republicans. A recent email to supporters notes that Brown doesn't stand "with the people of Massachusetts." Instead, he's on the side of "big money and his Republican buddies." Meanwhile, a new Brown ad relaunches controversy over Warren's heritage. The ad points to questions over whether she used claims of Native American heritage to advance her career, the Washington Post reports. "Claims of Indian heritage"? Is that like mitt showing up at a Mexican speech in brown face? Why does he dye his hair black? What is the matter of being native american? If Brown and his staffers have a problem with it maybe they should stay home and teach their kids how to masterbate. Mass. doesn't need a bigot in office. "Professor Warren" I can't believe that this is seen an insult. Folks, your country is broken.